The University of Southern California will award honorary degrees to Japanese American former students who were interned during World War II. President C.L. Max Nikias will confer the honorary baccalaureate and honorary master’s degrees at this year’s commencement ceremony on Friday, May 11. Nisei students at USC and many other universities were forced to abandon their studies in 1942, when President Franklin Roosevelt ordered the internment of American citizens of Japanese descent and Japanese nationals living along the Pacific coast. In recent years, several schools have presented honorary diplomas to Nisei students during commencement ceremonies. AB 37, introduced by Assemblymember Warren Furutani (D-Long Beach) and signed into law by Gov. Arnold Schwarzenegger in 2009, required the California Community College and California State University systems and requested the University of California Board of Regents to confer such degrees. Although private institutions are not covered by the legislation, many have also recognized the Nisei. Nisei students who were forced to leave USC in 1942 can register for an honorary degree and an invitation to commencement at www.usc.edu/commencement or by contacting Grace Shiba, senior director of alumni relations at USC, at (213) 740-4937 or [email protected] Families of deceased Nisei students can receive a certificate of honorary alumni status and an invitation to commencement through the website or by contacting Shiba. This marks the second time that USC has recognized its Nisei students. In 2008, the university granted honorary alumni status to Nisei students at the annual Asian Pacific Alumni Association’s Scholarship and Awards Gala. That year the university and the association also announced the creation of an Honorary Nisei Student Scholarship, and USC honored the Nisei at a ceremony at a Trojan football home game. Kaji told the Rafu Shimpo on Friday that he is planning to boycott the ceremony because there will be no posthumous degrees for Nisei who have passed away, unlike the UC, CSU and California Community College ceremonies. 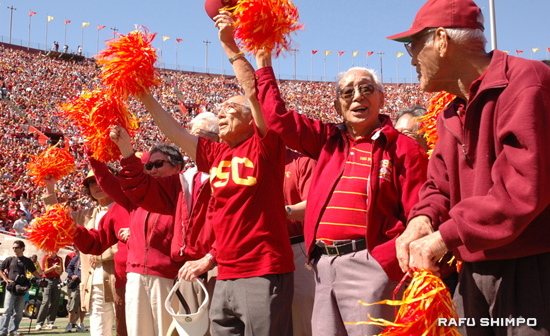 On his Facebook page, Kaji posted a photo of Dr. Tad Ochiai, a loyal USC fan who died on March 5 at age 97. “Will SC give him an honorary degree like the other West Coast Nisei students who were unjustly interned during World War II?” Kaji asked. Mory told the Rafu, “USC is very excited about the opportunity to award honorary degrees to Trojan Nisei. USC’s policy regarding honorary degrees limits them to living candidates. As such, only living Nisei are eligible for honorary degrees.